One of the many reasons I love cooking chicken in the crockpot is because the meat always turns out moist and juicy. Unfortunately, the skin also always turns out mushy and unappetizing. Is it possible to have juicy chicken and crispy skin? 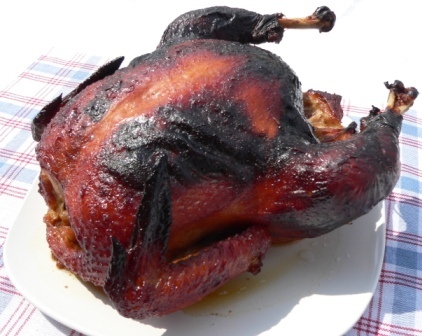 I have found that yes, you can have crispy skin and juicy chicken! Go ahead and cook your chicken in the crockpot. When it is ready to eat, simply transfer your chicken to a rimmed baking dish and stick it in an oven preheated to 500 for about 15 minutes or until the skin is golden and crispy. Rotate the chicken as needed to ensure even crisping. Good chicken falls apart when you remove it from the crock. This makes it difficult to transfer the chicken to the baking dish. 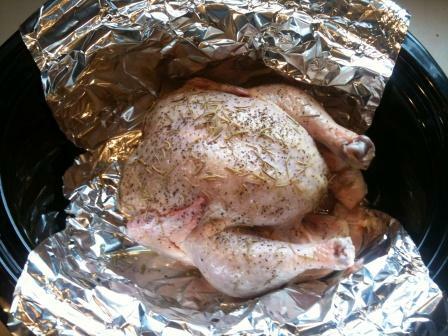 Manger a trois suggests making an aluminium foil sling for the chicken. Simply line the crockpot with the foil so that the foil hangs over the edges of the crock. When the chicken is ready, remove the chicken by lifting the sling. Lay the aluminium foil sling out flat in a rimmed baking dish and place in the oven. Generally, I try not to cook with aluminium foil since aluminium gets into the food and there seems to be a connection between aluminium and alzheimer’s disease. I save this technique for special occasions. For our typical dinner, if the chicken falls apart, I simply roast the pieces as they are. Works for me! For many reasons, I try to only buy locally pastured chicken. 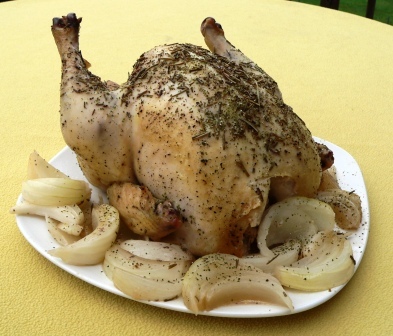 The only down-side of cooking unprocessed chicken is the meat often turns out dry. 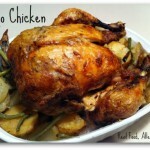 Have you noticed that farm raised chicken is dryer than store bought chicken? If you look closely, you will notice that store-bought chicken has a note on it that says something like “contains up to 15% chicken broth.” Sometimes the word “enhanced” is used. What exactly does that mean? It means the meat was injected with a solution of water, salt, sodium phosphates and/or other additives in order to make the meat more juicy. Bleck! If you cook and eat the store bought chicken without seasoning it with salt, you will consume 25-36% of your daily sodium limit. If the thought of ingesting the manufacturer’s processed salt cocktail doesn’t disturb you, maybe the damage to your wallet will. Maybe farm raised, pastured chicken isn’t that expensive after all? What a smart idea! I never even tried to figure out how to get crispy skin from a slow-cooked chicken; but this is very good to remember for when company comes! This is a great idea! 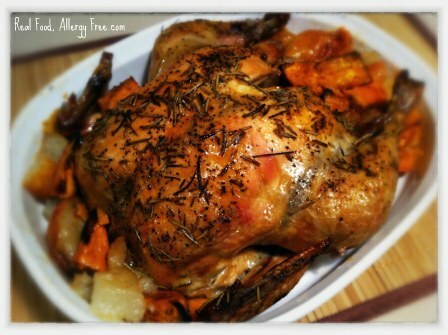 The crispy skin thing is the main reason I roast my chicken/turkey in the oven. 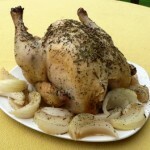 I hate to spend a bundle on good quality chicken/turkey and then not get as much flavor as possible. 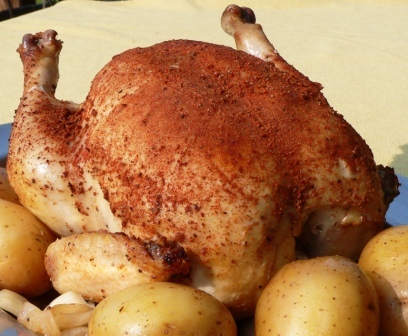 I’d love to get a rotisserie at some point too, but I’m going to try this in the meantime. Hi Jennifer, I know what you mean about spending money and the end result being disappointing. 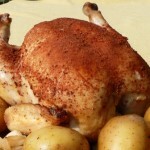 Have you seen this recipe for “rotisserie” chicken in a crockpot: http://www.realfoodallergyfree.com/2011/06/rotisserie-chicken-in-the-crockpot-recipe/ It’s my most popular recipe. OK, so that looks great too. Today is my grocery store day too. Great timing! Oh no. They inject our chickens too? I thought only turkeys were pumped full of things that shouldn’t be in there. Fab. 🙁 Another label I need to read. I know. It gets old doesn’t it? These are great tips, chicken from the store is my weakness and though my crock pot chickens are tender and juicy I miss the crispy seasoned skin. I will give this a try! I love it when things come together! I hope you enjoy the tip as much as me. Thanks for taking the time to leave a comment. Wow, that chicken looks so good! Thanks for the tip on making it with crispy skin. I will have to try that. Another reason pastured chicken is not as tender is because free ranging hens are actually using their muscles! Chickens raised in confinement cannot move around as much. 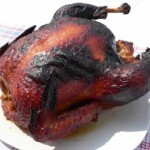 And the amount of flavor the chicken has is also affected by how it is raised. I am amazed when I eat out at a restaurant, how flavorless the chicken is. No wonder they have to add so many seasonings, MSG, and other junk! Great point, Becky! The grain fed/pasture fed has something to do with it too. We could probably go on and on! Thanks for stopping by and leaving a comment. I’m off to check your blog out now. Instead of foil has anyone tried like cheesecloth? That’s a great idea Hannah! I can never find cheesecloth. If you try it please let me know how it works. 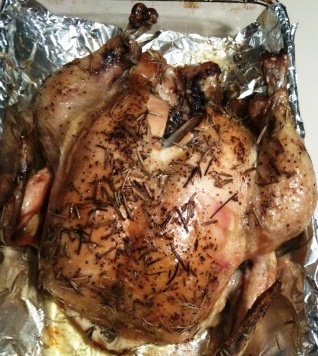 If you brine your poultry (even home raised), it will always turn out moist! Also, remember to let your meat rest before cutting it in order to allow the juices to redistribute. Hi! My my, that chicken in the crock pot then ‘crispied’ in the oven made me hungry!!!! So, I’m wondering if one uses the crockpot liners, can the chicken be lifted out that way and placed on a baking sheet to brown? Oh I suppose the liners aren’t good for us either, eh? !! sigh !! That’s a great idea Wolfie! I would guess they are not the best for you but if you are using them anyway they might work well. Thanks for sharing! I am so spoiled by pastured chickens, not only that but *soy-free* pastured chickens, that the texture of commercially raised chicken just turns me off. It has a sort of slimy texture by comparison. I still use it for covering baked dishes sometimes but never in a liquid environment. Cheesecloth would work great but then you have to decide if you want it to be disposable or if you want to wash it. It might be a chore to get cooked in bits out of the weave. Have you thought of parchment paper? You might have to use a double layer for strength but I bet it would do a nice job and it would hold up well in the hot oven. Hi – I have a crock pot that has been on a closet shelf for years, and I just decided to get it out and try using it – for the first time. I looked at a recipe for a chicken, sweet potato & veggie stew that sounds good, but it says to put all of the ingredients, including chicken breasts cut in 1″ cubes, in the pot, set it, and that’s it. It does not actually say whether you are starting with raw chicken or already cooked (like leftover), and the idea of just throwing raw chicken in with veggies kind of freaks me out – even if it does cook for hours on a low setting. Wouldn’t you want to brown it first? And if you did, would the cooking time be reduced? And would browning first make the meat dry? Clearly I’m a novice at this type of cooking, and now I remember why my slow cooker has been in the closet all this time! Please help. Thanks! Bunny, Your note made me smile. 🙂 Yes, one of the main benefits of a crock pot is the ability to throw everything in it and walk away. Yes, it is perfectly safe to throw raw meat in with the veggies. You will definitely be killing any bacteria in the cooking process. If it really freaks you out, you could put the meat in and let it cook by itself for an hour. Then you could toss the veggies in on top. But really, that is not necessary! Nancy, thanks so much for answering my question. I will try out that recipe very soon. I know I’m way behind the times on this, but Wow! – a whole new level of convenience. And a wedding gift finally put to use 🙂 Thanks again! Can you not just put the entire crockpot in the oven to brown the chicken? You probably could but it would be difficult to brown it evenly in the crock. You just saved my dinner! I mixed the rub my recipe called for and hated the taste of the 2 tsps of paprika it called for (obviously what they were using to give the crockpot chicken color) — so I dumped it and mixed just the lemon juice, olive oil, salt & rosemary. Naturally, I ended up with a seriously anemic looking chicken with company coming in half an hour. My husband didn’t believe I could find a solution in time… Thank you so (!) much.